This DIY is a part of the Cut it Out series, a special series for the CO-OPhx Clothing Swap! Welcome to those of you who found us through the clothing swap and welcome to those who found us through another outlet. Thank you for visiting! This DIY shows how to turn a plain white T-shirt into a fun & flirty cropped tie front top with cut out shoulders. Cut out shoulders is one of the biggest trends of the season and is so easy to do yourself. 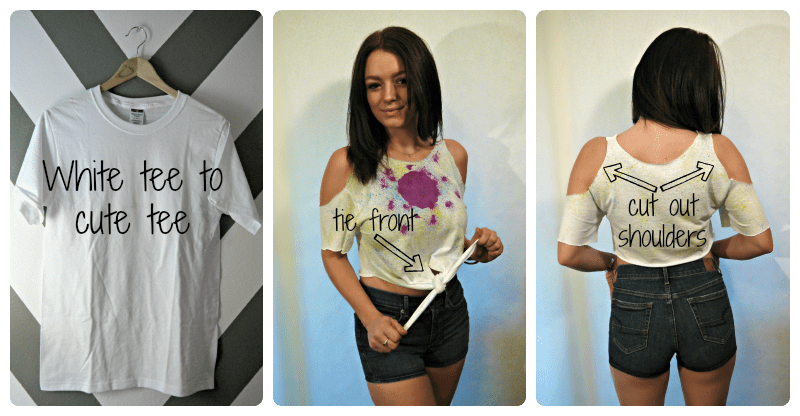 There’s no need to spend extra money buying a designer product when you can up-cycle an old graphic tee or give life to a cheap plain tee from Walmart or Target.